Credit: Robert Indiana, SEVEN, 1980/2003, ed. 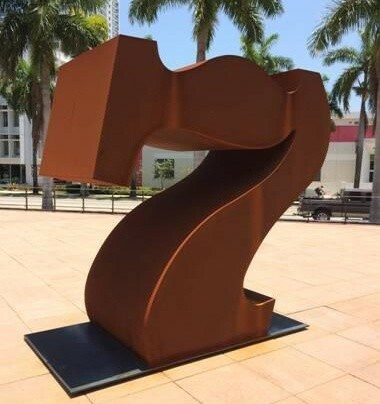 4/5, Corten steel, fabricated by Milgo/Bufkin, Brooklyn, New York - Robert Indiana's Seven installation shot in Miami. Courtesy of the Portland Museum of Art. Conceived in the 1980s and finally created in the '90s, Robert Indiana's Seven sculpture has found a new permanent home in front the Portland Museum of Art in Portland, ME. The 3,000 pound 8-foot-tall sculpture inadvertently illustrates the museum's address at 7 Congress Square and is set to be the star of the city's First Friday art walk. Though the sculpture was not created until the mid '90s, it was a part of a series of sculptural numbers commissioned in 1980 by the Indianapolis Museum of Art (IMA), which went from zero to nine. The original polychrome aluminum series for the IMA came to fruition, however Indiana's hope to produce a larger steel series of numbers was stopped in its tracks due to lack of funding until over a decade later. Once complete, Indiana attempted gifting Seven to the Prince of Monaco, though the prince unfortunately turned down the offering. Most recently the sculpture was on view in a Miami square through the summer. Seven will be the 18th piece of artwork by Robert Indiana in the Portland Museum of Art's collection of the Maine based artist.